Daniel Dusek is a traitor. Captain Daniel Dusek, the former deputy director of operations for the Navy’s 7th Fleet has been sentenced to nearly four years in prison for his treasonous involvement in a bribery scandal. Dusek pleaded guilty last year (2015) to conspiracy to commit bribery, admitting he traded classified information for luxury gifts and access to prostitutes. He was sentenced to 46 months on Friday. He’s the highest-ranking officer who has faced charges for his involvement in the scandal. Two admirals had their access to classified material suspended several years ago, over alleged connections to the scandal. To this day, both admirals — one of whom is the Navy’s intelligence chief — are blocked from viewing classified documents. Francis plied officers with vacations, prostitutes, cash and gifts including “top-shelf alcohol, ornamental swords and handmade ship models,” the Associated Press reports. Dusek acknowledge that he received free hotel stays, alcohol, meals, gifts, entertainment and prostitutes. In return, he would send Francis and his employees classified Navy ship schedules, giving the contractors information that helped them overcharge the military. Before his sentencing at a federal court in San Diego, Dusek told the judge, “I will hold this guilt in my heart for the rest of my life,” the AP reports. After serving as Deputy Operations Officer for the 7th Fleet, Dusek commanded the USS Essex and then the USS Bonhomme Richard. He was relieved of duty as commander of the Bonhomme in 2013 over the bribery scandal. 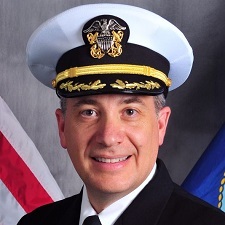 After pleading guilty to bribery in 2015, Dusek remained on active duty at a desk job, Navy Times reported. In addition to his prison sentence, Dusek will also have to pay $100,000 in fines and restitution to the Navy. Ten other people, including Naval commanders, have been charged so far for their involvement in the corruption scandal. “In a fresh revelation, Dusek said Francis went so far as to purchase a decommissioned British naval vessel and turned it into a party boat to entertain top U.S. Navy officials. The ship, originally known as the RFA Sir Lancelot, was rechristened the Glenn Braveheart after Francis bought it in 2003. So apparently rank has its privileges, for Dusic received less than four years. That seems a bit light for what really amounts to treason from a Navy officer.